Colonies of South American grass-cutting ants maintain temperature and humidity via a thatched nest and systematic arrangement of nest material. Ants are social insects with colonies that control their environment through collective building activities. Unlike underground species, the South American grass-cutting ant builds a thatched nest on the surface of the ground. A thatched nest is a mound structure formed from plant fragments and debris. This structure has a single central chamber where the ants cultivate fungi to feed their young (the brood). The ants must effectively regulate temperature and humidity within the thatched nest to provide ideal conditions for the fungus and brood. This is possible with the help of a thatched nest structure and the ants’ building behavior. In the long term, the thatched nest provides a good amount of insulation. This is because the thatch material, compared to soil and the environment, reacts less quickly to changes in temperature. This limits the amount of heat that flows through the structure. Limited heat flow prevents the nest from overheating during the day and prevents major heat loss at night. The ants even place a five to ten centimeter layer of regurgitated grass fragments (called mulch) on the ground to limit the heat exchange between the fungus and the underlying soil. The nest’s insulation effectively entraps the internal heat generated by the ants and the fungi, enabling the fungus garden to remain five degrees Celsius above the average soil temperatures in all seasons. This is essential for favorable growth of the fungus and the brood, which prefer an optimal temperature of 24.1 degrees Celsius and high humidity. In the short term, the South American grass-cutting ants display building behaviors to maintain the internal nest climate. As the nest reaches a temperature that might be harmful to the fungus or the brood, the ants create numerous openings in the thatched structure to allow the cooler air in from the outside to reduce the heat. However, the ants also show a response to any humid air leaving the nest by depositing material to close and seal openings. The colony constantly makes trade-offs between these two actions to locally control temperature and humidity shifts. Furthermore, these ants were found to deconstruct clusters or piles of material and relocate the items to allow for thatch turnover. This constant shifting of the thatch improves the insulation by moving the humid organic material (which has less insulation) from the inside of the nest to the outside, where it can dry more quickly. It also loosens the structure to provide better nest ventilation. 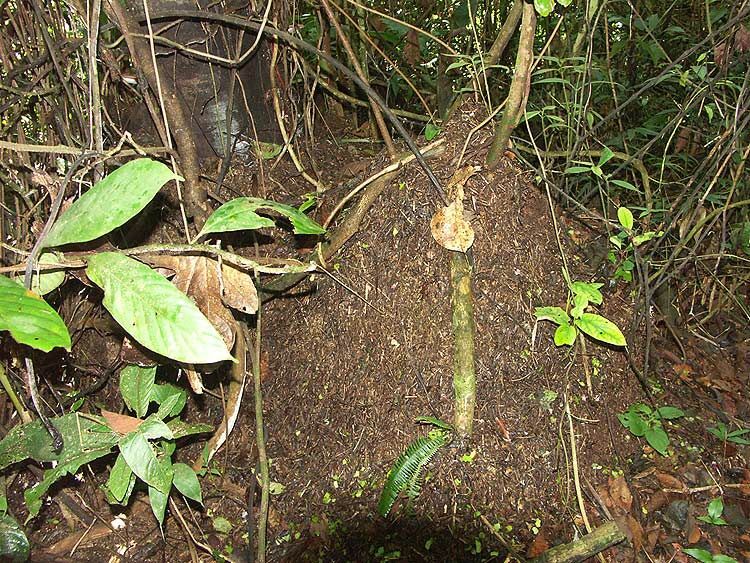 The nest of the South American grass-cutting ant is able to thrive due to the temperature and humidity control provided by its thatched structure and the active participation of the ants. The adaptations of this species have ultimately enabled it to extend its distribution range more in southern temperate regions compared to other subterranean species. This summary was contributed by Leon Wang and Jack Mevorah.